On data privacy, Sundar Pichai said that it is an ongoing area of effort and on a censored Search app, he noted that the Google has no plans to launch a search engine in China. After all major tech companies testified before Congress over a number of issues, including privacy and data collection, facing tough questions in their alleged role in meddling from Russia in the 2016 US presidential elections, it was time for Google to take the hot seat to testify and (perhaps) come clean on the issues that took centre stage in 2018. Google was a no-show when representatives from its fellow Silicon Valley companies appeared for the hearing before the Senate Select Committee in September. 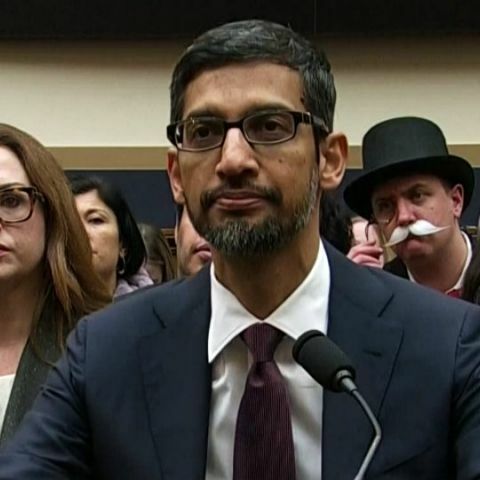 With this appearance, Google proved congressmen who accused the company of trying to skirt scrutiny wrong. Just like Facebook and Twitter, Google was also alleged to play a role in the 2016 US election meddling, but it has already distanced himself of any political bias. On an accusation that Google suppresses conservative voices, Pichai reiterated the company’s stance saying that Google’s algorithms do not favour any specific ideology or demographic and has always returned most relevant results. On a question about why image results for “idiot” reveal a page of US President Donald Trump's photos, Pichai said that these results could be affected by the time of users’ search. “Congressman, I understand the frustration of seeing negative news, and, you know, I see it on me,” Pichai said. “What is important here is we use the robust methodology to reflect what is being said about any given topic at any particular time. And we try to do it objectively, using a set of rubrics. It is in our interest to make sure we reflect what's happening out there in the best objective manner possible. I can commit to you, and I can assure you we do it without regards to political ideology. Our algorithms have no notion of political sentiment in it,” he explained. A lawmaker then questioned Google’s algorithms alleging that Google manipulates its algorithms to favour political entities. To this, Pichai clarified that it was “impossible” for any individual or group of individuals to manipulate its algorithms. “I lead this company without political bias and work to ensure that our products continue to operate that way. To do otherwise would go against our core principles and our business interests. We are a company that provides platforms for diverse perspectives and opinions – and we have no shortage of them among our own employees,” he said. On a question of unveiling a censored search engine in China, Pichai refused by saying that the company has “no plans to launch search in China.” He also added that internally Google has developed and looked at what search could look like in China, with about a 100 engineers working on the project at a point in time. “We’ve had the project underway for a while. At one point, we’ve had over 100 people working on it is my understanding,” Pichai clarified. Google Search was blocked in China in 2010, but earlier this year, reports suggested that the company has making attempts to re-enter the market and is pondering to comply with government’s strict censorship laws and blacklist websites and search terms about human rights, democracy, religion, and peaceful protest. He also noted that Google is holding no discussions with the Chinese government and if the company were to launch Search in the South Asian country, he would be “fully transparent” with policymakers. “We think it’s in our duty to explore possibilities to give users access to information,” he added. When asked how transparent is Google when it comes to users’ data collection, Pichai clarified the language of Google's policy and said that the company collects information to provide services that users want. He clarified that Google has given users the ability to control their privacy concerns. The top executive claimed that more than 160 million people had checked their Google privacy settings in the last month and the company still wanted to make it easier for “average users” to control their data. “We always think that there is more to do. It’s an ongoing area of effort,” he added. A lawmaker asked Pichai whether Google could track his movements if he moved from one side of the room or the other, the executive said he would need to check the phone’s settings to know this. To this reply, the representative interrupted and commented that it wasn’t a “trick question,” and he could have answered in a Yes or a No. During the hearing, Pichai also pointed out the American-ness of the company. “It’s no coincidence that a company dedicated to the free flow of information was founded right here in the US. As an American company, we cherish the values and freedoms that have allowed us to grow and serve so many users,” the top executive said.